Background: Chronic myeloid leukemia (CML) is one of the indolent myeloproliferative neoplasms. It is characterized by the presence of the Philadelphia chromosome, a translocation between chromosomes 9 and 22 or BCR-ABL1 gene. Objectives: The aims of this study were to evaluate characteristics of CML patients and their molecular response to tyrosine kinase inhibitors (TKI) in Erbil city in Iraq. Patients and Methods: Seventy-six patients with CML were recruited in this retrospective and prospective study from February 2014 to March 2016, at Nanakaly Hospital for Blood Diseases in Erbil city – Kurdistan region of Iraq. They were evaluated from clinical point of view and their laboratory data, and molecular responses to TKI based on polymerase chain reaction were analyzed. 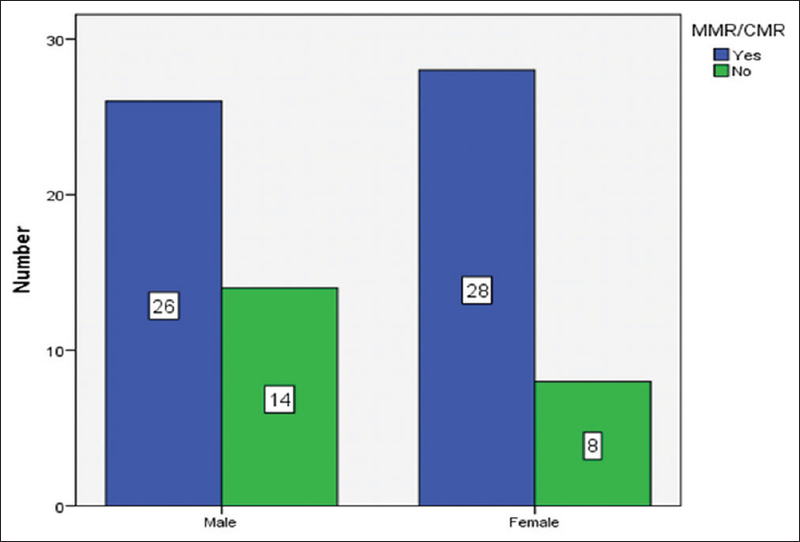 Results: The median age of participants was 45 years; the male: female ratio was 1:0.9. The main presenting features were abdominal fullness in 66% and splenomegaly in 95% of patients. Nearly 66% of them had low European Treatment and Outcome Study (EUTOS) score; 70% of patient had major or complete molecular responses (MMR/CMR). There was a significant difference between patients who did versus who did not achieve MMR/CMR in hemoglobin level, promyelocyte, and myelocyte percent, EUTOS, and Sokal scores (P = 0.02, 0.006, 0.03, 0.001, and 0.02, respectively). Conclusion: In the current study, CML patients were at a younger age of onset, and more high EUTOS score. The majority of patients achieved MMR with frontline Imatinib or Nilotinib and those who switched from Imatinib to Nilotinib as well. Chronic myeloid leukemia (CML) is a clonal myeloproliferative neoplasm, characterized by t(9:22) translocation, which produces the BCR-ABL fusion gene which codes for an abnormal tyrosine kinase responsible for the malignant proliferation of myeloid cells. CML used to be classified into three disease phases: chronic phase (CP), accelerated phase, and blast phase (BP) with diagnosis most commonly made during the CP. CML can be easily diagnosed in an appropriate clinical setting with view of typical hematology and morphology findings. It could be diagnosed in the presence of splenomegaly, leukocytosis (with predominance of neutrophils and myelocytes), and hypercellular bone marrow (BM), which is mainly granulocytic or granulocytic and megakaryocytic hyperplasia. The Philadelphia (Ph) chromosome is usually present in 100% of metaphases, often as the sole abnormality; 10%–15% of patients have additional chromosomal abnormalities. A few CML patients may not demonstrate Ph chromosome yet have clinical course and morphological features just like typical CML. Cytogenetic and molecular analyses by fluorescent in situ hybridization (FISH) and polymerase chain reaction (PCR), respectively, have become mandatory for diagnostic evaluation and monitoring response to tyrosine kinase inhibitors (TKIs). PCR is either qualitative used as a diagnostic tool, while quantitative reverse transcriptase-PCR (RT-PCR) is highly sensitive for detection of Minimal Residual Disease MRD. Anytime: Stable or improving MMR. A good correlation exists between BM cytogenetics and transcript levels in peripheral blood, with a BCR-ABL1 ≤10% equivalent to a major cytogenetic response and a BCR-ABL1 ≤1% equivalent to a CCyR. The aim of this study is to assess CML patients at Nanakaly hospital; evaluating their main clinical presentation, the laboratory profile, the prognostic risk group distribution according to Sokal and EUTOS scores, and molecular response to TKIs. The study designed as a prospective and retrospective observational study. It is conducted at Nanakaly Hospital for Blood Diseases and Oncology in Erbil City. Seventy-six patients were enrolled extending from February 2014 to March 2016; 52 patients were diagnosed between September 2003 and January 2014, and they recruited retrospectively while 24 patients were diagnosed from February 2014 to March of 2016 and they are prospectively recruited. The study was approved by the scientific and ethical committees of the College of Medicine-Hawler Medical University. The diagnosis was based on the clinical findings, complete blood picture, BM examination, biochemistry investigations (liver function tests, renal function tests and lactate dehydrogenase [LDH]), and ultrasound of abdomen. All patients had molecular studies (RT-PCR) regardless of their cytogenetic (FISH) status. Those that stopped CML treatments. The Sokal score and EUTOS score were calculated using previously published formulae (below) which was used to classify the patients into different risk groups. Sokal score = Exp [0.0116× (age in years-43.4) +0.0345× (spleen size-7.51) +0.188 9 ([platelet count / 700]2-0.563) +0.0887× (blast cell counts-2.10)], where Exp is the exponential function. EUTOS score = (7× basophils) + (4× spleen size). Complete molecular response (CMR) recently labeled “deep molecular response” which includes MR,4 MR 4.5 and MR 5 (≤0.01% IS, ≤0.0032% IS, and ≤0.001IS respectively). Data were recorded on a specially designed questionnaire, collected and entered in the computer and then analyzed using Statistical Package for Social Sciences (SPSS (Armonk, NY: IBM Corp, USA)) version 22 and the results compared between patients with different variables, with a statistical significance level of P ≤ 0.05. The results presented as rates, ratios, frequencies, and percentages in tables and figures and analyzed using t-test, Chi–square, and regression tests. This study recruited 76 patients; with a mean (± SD) age of 43.3 (SD 15.6) years. Age range was 12–80 at diagnosis; median age was 45 years, with the majority 70% of the patients being between 30 and 59 years. Data are shown in [Figure 1]. There was 40 males (52.6%) and 36 females (47.4%); the male to female ratio was (1:0.9). Most of the patients 97% were in CP. The main clinical presentations were abdominal fullness, pallor, weight loss, and fatigue (66%, 58%, 54%, and 45%, respectively); splenomegaly was the predominant (95%) physical sign with a mean longitudinal axis (± SD) of 17.86 (±4.6) cm; 26% among them had massive (>10 cm below costal margin) splenomegaly. Only 4% of patients were asymptomatic. Other parameters at diagnosis are shown in [Table 1]. The main hematology laboratory findings are shown in [Table 2]. Hemoglobin (Hb%) mean (±SD) value was 10.4 ± 2 (range 5–15.3 g/dl); 90% of male and 72% of female recruited patients were anemic at presentation [Figure 2]; White blood cell (WBC) count mean (±SD) was 178.5 ± 112 (range 24–580 × 109/l). 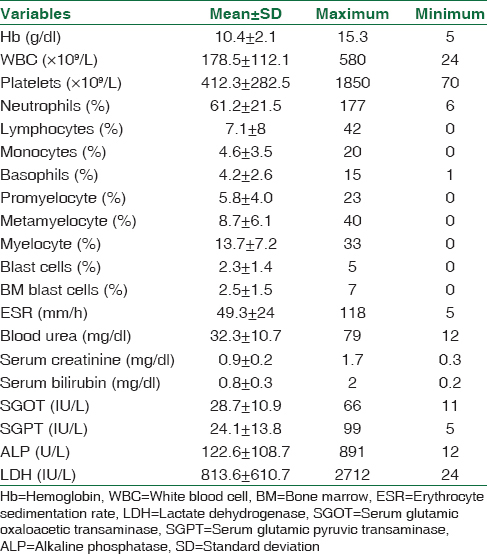 In 82% of patients, WBC count was >100 × 109/l [Figure 3]. The mean (±SD) of platelet count was 412.3 ± 282.5 (range 70–1850 × 109/l); 38% of enrolled patients had thrombocytosis and 4% of them had thrombocytopenia [Figure 4]. All patients had BM examination and the main finding was granulocyte and megakaryocytic hyperplasia (95% and 55%, respectively). The BM blast cell percentage at the time of diagnosis ranged from 0 to 7 with a mean value of 2.5 ± 1.5. Regarding the biochemistry laboratory findings at presentation [Table 2], LDH was high in 91% of enrolled patients with a mean (±SD) of 813.6 ± 610.7; liver enzymes alanine aminotransferase and aspartate aminotransferase were normal in about 95% of patients with a mean value of 24.1 ± 13.8 and 28.7 ± 11, respectively. The entire patients had a standard treatment with TKI; 89.4% of them treated initially with Imatinib Mesylate (Gleevec®) in a dose of 400 mg daily; among whom 38 patients (50%) were switched to Nilotinib (Tasigna®) 400 mg twice daily (bid) either because of primary resistance or due to nonmaintained MMR. In eight (11%) patients, Nilotinib was given as a frontline treatment in a standard dose of 300 mg bid. Fifty-four (71%) patients achieved MMR/CMR regardless of the type and dose of TKIs [Table 3]. 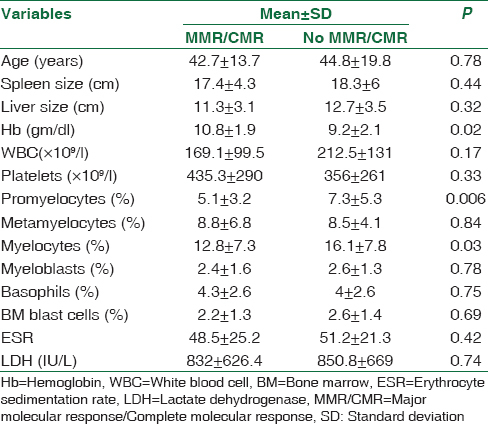 Comparison of clinical and laboratory characteristics of patients who did versus did not achieve MMR/CMR revealed some significant differences [Table 4] and [Figure 5]; age, gender, spleen size, initial total WBC count, erythrocyte sedimentation rate, and LDH were not significant predictive factors to achieve MMR/CMR, while Hb level, promyelocyte, and myelocyte count were significantly different among both groups with P = 0.02, 0.006, and 0.03, respectively. Considering the association between molecular response and the type of TKI used, CML patients were divided into 3 groups [Table 3]. Patients who were treated with frontline Imatinib (68 patients) were subdivided into two groups: (1) patients who were continued on Imatinib (30 patients), and (2) patients who switched from Imatinib to Nilotinib (38 patients). Patients received Nilotinib as frontline comprises the third group (8 patients). There was no significant difference among those who achieved MMR/CMR and the type of TKI (P = 0.68) [Table 3]. 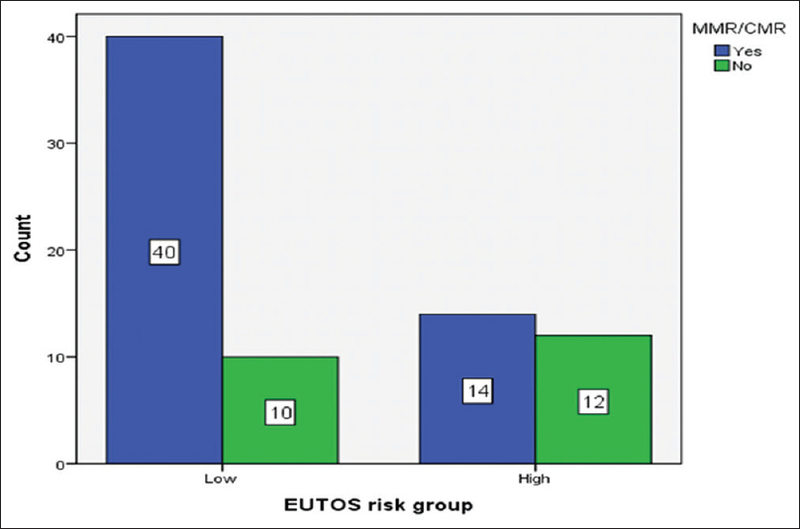 The frequency of low-risk patients according to Sokal and EUTOS scores [Figure 6] and [Figure 7] was significantly higher (P = 0.02 and 0.001, respectively) among those achieved MMR/CMR. CML presents itself at a younger age than in western countries. In the current study, the median age of patients is 45 years; it is almost the same as registered in Baghdad (44 years) and quite close to the neighbor countries like Iran and Turkey (41, 46 respectively);, this disparity in the main age group is probably related to the genetic background. The majority of enrolled patients was symptomatic; only 4% of them were asymptomatic in comparison to western data where approximately 40% of patients are asymptomatic and diagnosed on the basis of abnormal counts. Faderl et al. reported that 50% of CML cases has been detected by routine tests. Most of the patients (90% male, 72% female) were anemic at presentation; the majority 82% of them had marked leukocytosis of >100 × 109/l. 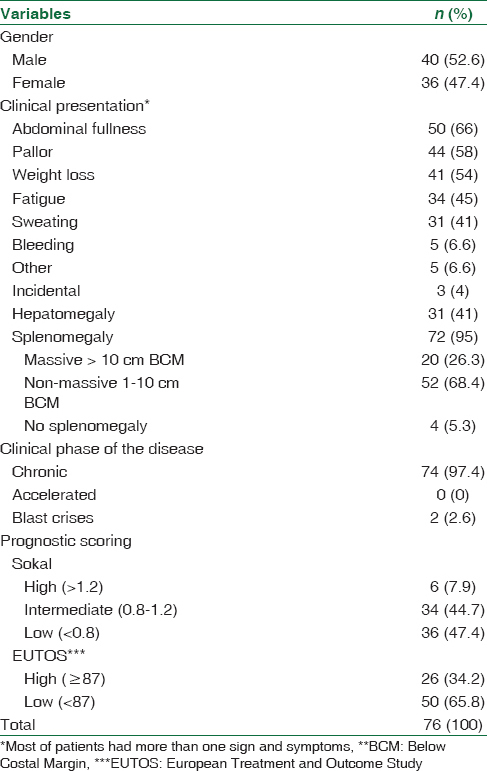 Splenomegaly was seen in 95% of patients with about a quarter of them had massive splenomegaly; while data from the EUTOS population-based registry  revealed no palpable spleen in 53.5% of the patients, and a big spleen (⩾10 cm below costal margin) was reported in only 15.2%. On the other hand, our finding was exactly similar to those reported in Pakistan; this disproportional finding probably relates to a better medical care with a current medical practice enhancing an earlier diagnosis in developed countries and to a lower degree of orientation and awareness of our population about such a medical problems. 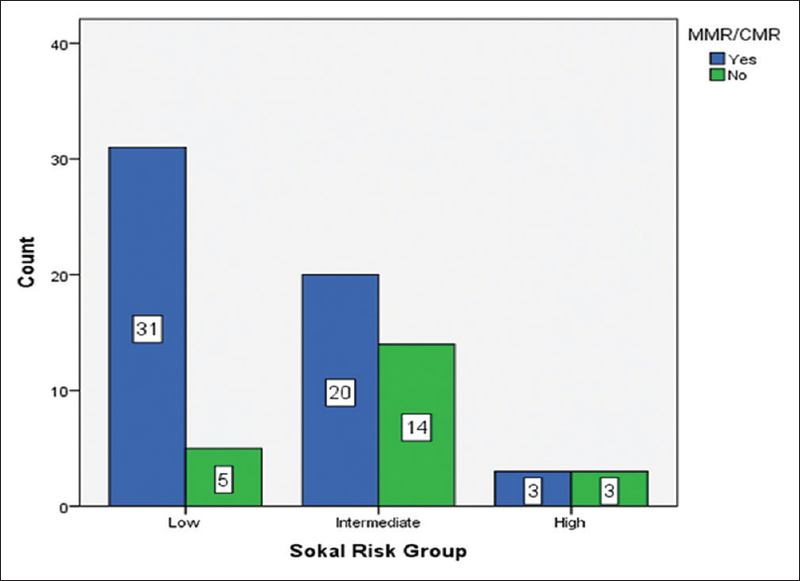 The risk group distribution of the studied patients shows predominance of low and intermediate Sokal risk groups (47%, 45% respectively); this is in accordance with other studies. In the study by Hasford et al., 39%, 37%, and 24% of cases had low-, intermediate-, and high-risk Sokal scores, respectively. A Japanese study also had lower proportion of cases 18.6% of high Sokal score. Regarding EUTOS score, the low score was predominant at 66%, but the high score (34%) in the current study was more frequent than their counterpart in the USA, Europe, and Japan 10%–11%.,, This could be explained by late presentation of patients; second, due to high basophil count with a mean (±SD) of 4.26 ± 2.65; and third, the majority of patients had splenomegaly (the last two factors are the main components of EUTOS score equation as mentioned earlier). The EUTOS score was reported to have superior prognostic value than Sokal score in evaluating patients with CML on Imatinib treatment. One of the aims of CML treatment is to avoid disease progression from CP to BP. Because CML patients who obtained MMR had a significantly lower risk of disease progression, MMR at 18 months has been an important surrogate biomarker for the long-term outcome prediction of Imatinib treatment according to the ELN recommendation guidelines. About 70% of patients in the current study achieved MMR, which is comparable to some extent to other studies from PETHEMA (Spain), German Study Group IV and GIMEMA (Italy) studies 63%–85%,,, and much higher than International Randomized Study of Interferon and STI571 (IRIS study) and a Turkish study (39% and 49% respectively)., Fortunately, nowadays, with availability of RT-PCR, we could apply newly upgraded ELN guideline for treating our CML patients. In the current study, there was a statistically significant difference in hemoglobin level, promyelocyte, and myelocyte count between those who achieved MMR/CMR versus those who did not, while other variables such as age, gender, initial total WBC count, spleen size, and LDH were not significantly correlated. There was a significant association as well between molecular response and risk group scores: 80% of those with low EUTOS score and 86% low Sokal scores achieved MMR/CMR [Figure 6] and [Figure 7]. There was no statistically significant correlation between the type of TKIs used and rate of MMR/CMR (P = 0.68), this was not comparable with ENESTnd study (Evaluating Nilotinib Efficacy and Safety in Clinical Trials-Newly Diagnosed Patients) that showed a statistically significant higher rates of MMR was achieved for Nilotinib compared with the Imatinib group (44 and 43% vs. 22%, P < 0.001). This discordance is mostly linked to the smaller number of our patients whom treated with Nilotinib as a frontline. This attributed to: (1) the policy of Nanakalys Hospital (Nilotinib was used for the first time at Nanakaly hospital in 2012) for using Nilotinib (Tasigna®) mainly as a second line for patients with Imatinib (Gleevec®) resistant and failure, and (2) irregular availability of Nilotinib, makes its prescription to be limited. In the current study, CML patients were at a younger age of onset, were in the CP, had more splenomegaly, more leukocytosis, and more high EUTOS score. The majority of patients achieved MMR with frontline Imatinib or Nilotinib and those who switched from Imatinib to Nilotinib as well. With current practice of RT-PCR monitoring for molecular responses and hopefully provision of regular supply of TKIs to our CML patients, the ELN recommendations could be applied precisely and patients who are not responding optimally to treatment can be identified and managed properly to minimize the risk for disease progression. Melo JV, Hughes TP, Apperley JF. Chronic myeloid leukemia. Hematology Am Soc Hematol Educ Program 2003; 17:132–52. Reichard KK, Larson RS, Rabinowitz I. Chronic myeloid leukemia. In: Greer JP, Foerster J, Lukens JN, Rodgers GM, Paraskevas F, Glader B, et al., editors. Wintrobe's Clinical Hematology. 12th ed. Philadelphia: Lippincott Williams & Wilkins; 2009. p. 2006-30. Lieveld JL, Lichtman MA. Chronic myelogenous leukemia and related disorders. In: Kauchanski K, Prcal JT, Press OW, Lichtman MA, Levi M, Burns L, et al., editors. Williams Hematology. 9th ed. New York: McGraw-Hill; 2016. p. 1437-90. Jabbour E, Kantarjian H. Chronic myeloid leukemia: 2014 update on diagnosis, monitoring, and management. Am J Hematol 2014;89:547-56. Sokal JE, Cox EB, Baccarani M, Tura S, Gomez GA, Robertson JE, et al. Prognostic discrimination in “good-risk” chronic granulocytic leukemia. Blood 1984;63:789-99. Hasford J, Baccarani M, Hoffmann V, Guilhot J, Saussele S, Rosti G, et al. Predicting complete cytogenetic response and subsequent progression-free survival in 2060 patients with CML on Imatinib treatment: The EUTOS score. Blood 2011;118:686-92. Ou J, Vergilio JA, Bagg A. Molecular diagnosis and monitoring in the clinical management of patients with chronic myelogenous leukemia treated with tyrosine kinase inhibitors. Am J Hematol 2008;83:296-302. Jabbour E, Cortes JE, Kantarjian HM. Molecular monitoring in chronic myeloid leukemia: Response to tyrosine kinase inhibitors and prognostic implications. Cancer 2008;112:2112-8. National Comprehensive Cancer Network (NCCN). Clinical Practice Guidelines in Oncology: Chronic Myeloid Leukemia 2016. Fort Washington: NCCN; 2016. Baccarani M, Deininger MW, Rosti G, Hochhaus A, Soverini S, Apperley JF, et al. European LeukemiaNet recommendations for the management of chronic myeloid leukemia: 2013. Blood 2013;122:872-84. Ross DM, Branford S, Moore S, Hughes TP. Limited clinical value of regular bone marrow cytogenetic analysis in Imatinib-treated chronic phase CML patients monitored by RQ-PCR for BCR-ABL. Leukemia 2006;20:664-70. Branford S, Fletcher L, Cross NC, Müller MC, Hochhaus A, Kim DW, et al. Desirable performance characteristics for BCR-ABL measurement on an international reporting scale to allow consistent interpretation of individual patient response and comparison of response rates between clinical trials. Blood 2008;112:3330-8. Bansal S, Prabhash K, Parikh P. Chronic myeloid leukemia data from India. Indian J Med Paediatr Oncol 2013;34:154-8. Matti BF, Alwan AF, Alwan AF. Evaluation of the safety of Imatinib Mesylate in 200 Iraqi patients with chronic myeloid leukemia in the chronic phase: Single-center study. Turk J Haematol 2013;30:387-93. Sahin F, Saydam G, Cömert M, Uz B, Yavuz AS, Turan E, et al. Turkish chronic myeloid leukemia study: Retrospective sectional analysis of CML patients. Turk J Haematol 2013;30:351-8. Jalaeikhoo H, Ahmadzadeh A, Toogeh G, Haybar H, Valizadeh A, Charoosaei R, et al. Six-year follow up of Imatinib therapy for newly diagnosed chronic myeloid leukemia in Iranian patients. Arch Iran Med 2011;14:378-80. Tardieu S, Brun-Strang C, Berthaud P, Michallet M, Guilhot F, Rousselot P, et al. Management of chronic myeloid leukemia in France: A multicentered cross-sectional study on 538 patients. Pharmacoepidemiol Drug Saf 2005;14:545-53. Faderl S, Talpaz M, Estrov Z, O'Brien S, Kurzrock R, Kantarjian HM, et al. The biology of chronic myeloid leukemia. N Engl J Med 1999: 15;341(3):164-72. Hoffmann VS, Baccarani M, Hasford J, Lindoerfer D, Burgstaller S, Sertic D, et al. The EUTOS population-based registry: Incidence and clinical characteristics of 2904 CML patients in 20 European countries. Leukemia 2015;29:1336-43. Khalil R, Hassan K, Asif N. Prognostic scoring in patients of chronic myeloid leukemia: Correlation between Sokal and Hasford scoring systems. J Islamabad Med Dent Coll 2006;1211:14-7. Yamamoto E, Fujisawa S, Hagihara M, Tanaka M, Fujimaki K, Kishimoto K, et al. European treatment and outcome study score does not predict Imatinib treatment response and outcome in chronic myeloid leukemia patients. Cancer Sci 2014;105:105-9. Baccarani M, Cortes J, Pane F, Niederwieser D, Saglio G, Apperley J, et al. Chronic myeloid leukemia: An update of concepts and management recommendations of European LeukemiaNet. J Clin Oncol 2009;27:6041-51. Cervantes F, López-Garrido P, Montero MI, Jonte F, Martínez J, Hernández-Boluda JC, et al. Early intervention during Imatinib therapy in patients with newly diagnosed chronic-phase chronic myeloid leukemia: A study of the Spanish PETHEMA group. Haematologica 2010;95:1317-24. Hehlmann R, Saussele S, Lauseker M, Proetel U, Kovaelevskaya E, Leitner A, et al. Randomized comparison of Imatinib 400 mg vs. Imatinib + IFN vs. Imatinib + Araa C vs. Imatinib after IFN vs. Imatinib 800 mg: Optimized treatment and survival. Designed first interim analysis of the German CML Study IV. Blood 2011;118:586-92. Gugliotta G, Castagnetti F, Palandri F, Breccia M, Intermesoli T, Capucci A, et al. Frontline Imatinib treatment of chronic myeloid leukemia: No impact of age on outcome, a survey by the GIMEMA CML working party. Blood 2011;117:5591-9. O'Brien SG, Guilhot F, Goldman J, Larson R, Druker B, Guilhot F, et al. International randomized study of interferon versus STI571 (IRIS) 7 year follow up: Sustained survival, low rate of transformation, and increased rate of major molecular response in patients with newly diagnosed chronic myeloid leukemia in chronic phase treated with Imatinib. Blood 2008;112:76-83. Bilen Y, Erdem F. Hematologic, cytoenetic and molecular responses to Imatinib therapy for chronic myeloid leukemia: A single centre experience in Turkey. Turk J Med Sci 2012;42:31-8. Larson RA, Hochhaus A, Hughes TP, Clark RE, Etienne G, Kim DW, et al. Nilotinib vs. Imatinib in patients with newly diagnosed Philadelphia chromosome-positive chronic myeloid leukemia in chronic phase: ENESTnd 3-year follow-up. Leukemia 2012;26:2197-203. Kantarjian HM, Giles FJ, Bhalla KN, Pinilla-Ibarz J, Larson RA, Gattermann N, et al. Nilotinib is effective in patients with chronic myeloid leukemia in chronic phase after Imatinib resistance or intolerance: 24-month follow-up results. Blood 2011;117:1141-5. Young Choi S, Eun Lee S, Jeong Y, Hyun S, Woodman R, Sezuzdlo T, et al. Nilotinib or high dose Imatinib compared with standard dose Imatinib in early chronic phase CML patients who have suboptimal molecular response to standard dose Imatinib: Including updated data from RE-Nice study. Blood 2013;38:432-42.